There are a lot of different ways that we can talk about the Eucharist and many different angles that we can approach it from. Books, long books, multi-volume books, have been written on the Eucharist and on its spirituality. In a few short introductory chapters we can do no more than to lightly scratch the surface. I’m not going to try to be comprehensive in any sort of way, rather, I want to give you some perspectives, some lenses, through which to view the Eucharist in hopes that they can enrich your vision of what we do in this celebration and what it means for our Christian life together. I want to begin with big metaphorical step back and gives us the broadest possible big-picture view before we head back in, take a look at our prayer book Eucharist and interact with what we find there. We are modern 21st century people; we can’t be anything other than this. We know our world and, for us, Eucharist is a church ceremony that happens on Sundays. I want to start by taking us out of our environment and putting us in a completely different headspace. The reason why I want to do this is because a new perspective will help us get a different angle on something that we’ve seen done over and over again. Here’s where I want to approach it from: the Eucharist, as religious practice, is deeply rooted in the sacrificial customs of Mediterranean antiquity. So, the place to start is the ancient Mediterranean mindset; we need to have a sense of what those people were thinking, in order to have a better sense of where Jesus and the early church were coming from. One particular element I want to highlight up front is this: when we think about sacrifice, and animal sacrifice in particular, we tend to focus on one particular aspect of it – the death of the animal. But when we do that, we miss so many other factors that are going on around it. We fixate on the moment and the concept of death, and we fail to see the other things that surround it. To get in this alternate headspace, I would like us to start out in Homer’s Iliad. One of the great epics of world literature, the Iliad is a long poem originally composed and handed down orally that was written down in Greek probably at some point in the eighth century BC. It tells the story of the great siege of Troy, a Greek city on the coast of modern-day Turkey, and the struggle of other Greeks – Achaeans – against the Trojans. As a result, the Iliad it gives us a glance into Greek society at a time when it was more closely aligned with its ancient neighbors in the Middle East then it would be in its later Golden age. roasted them evenly and drew them off. ladling drops for the god in every cup. lay down to rest under the stern hawsers. I have added in some letters to help us keep track of the action. One of the ways to analyze what is happening in this scene is to break it down into four pieces: [A] marks the deaths of the animals; [B] is when the meat gets cooked; [C] describes the meat being eaten together; and [D] is where the god is praised. I want to emphasize some points here. First, yes, a lot of animals are dying here. But notice how little emphasis is given to that fact. The animals die, but that does not seem to be the central point of this operation. Second, if there is a central point, it would be about the party and not the preparation. The emphasis is placed on the meal. Third, we should not miss the act of social reconciliation that is occurring. The men of Odysseus are not random guests who stopped in; they are pirates who sacked this town a short time before. The last time these men saw each other, they were likely trying to kill each other! The fact that the priest and his young men sat and ate with Odysseus and his men must not be overlooked. Fourth, there is an act of divine reconciliation going on as well. Apollo looks upon both the act (the restoration of the girl) and the sacrifice with favor, and is present with them – listening – in this event. One of the things that church people love to argue about is the basic nature of the Eucharist: is it a sacrifice or is it a meal? The way we answer this question has broad implications. For example, it determines whether that thing in the front of the church is an altar or a table. Well – what would Homer say? Let me suggest three main takeaways from this description of a Homeric sacrifice. First, there is the fact of the hecatomb: that’s a lot of cow! Consider all of the economic effort that goes into raising 100 head of cattle. This is quite a lot of property, this is quite a lot of wealth, that is being dedicated to the god. It is given to the god, and the giving is motivated by the god, and the secondary result of the gift is that it is also shared with the community. Second, meal and sacrifice are intimately related. We cannot escape the way that these are inextricably bound to one another. It is not an either/or; it is definitely a both/and. The meal cannot happen without the deaths, and the deaths enable the meal. Now – did the Greeks ever have sacrifices where the meat was not eaten, when it was burnt entirely? The answer is yes, but typically that occurred when they were making sacrifices to the dark chthonic gods of the underworld – the gods they had no interest in eating with! And that leads to the third point… Third, the meal is bidirectional: the humans are communing with one another and communing with the god to whom the sacrifice is being offered. Again, it’s a both/and. Now, I’m not suggesting that there is a direct line between Homeric sacrifice and the Christian Eucharist. Too much time and too many changes separate the two. However, there are broadly continuous themes here that we will also find when we look in the Old Testament record, and that are still found in the world of late antiquity which birthed the Church. If we take a look at the type of sacrificial events that show up in the Old Testament, we find three major categories. The first are the whole burnt offerings. As we discussed when talking about the Daily Office, you see this most in those alimentary offerings, when the point was to “feed” God in the temple. The second are the sin and guilt offerings. With these sacrifices, some of the meat was burned, the other portion was given to the priests to eat; you didn’t get to party if you are paying for a sin… The third are the thanks offerings and free will offerings. These were the occasions of rejoicing in God’s presence, or thanking God for his benefits. These sacrifices were shared with the priests and the community. This is the kind of meal most closely related to what we see in the Homeric vision. Furthermore, 1 Corinthians 10 reveals just how prevalent these understandings remained in the life of the early church. In this chapter, Paul wrestles with the issue of whether Christians are allowed to eat meat sacrificed to idols. The question that he is dealing with here is whether eating such meat is itself an act of communing with the god to whom it was sacrificed. On one hand, he wants to deny that the old gods have any power over the faithful; on the other hand, he understands how powerful the associations remain and does not want weaker Christians to be harmed by what they see more mature Christians doing. What makes this issue even more complicated is that most of the meat sold in a Greek market of his day would have come from a temple sacrifice! So, how does this peek into the past help us understand what we do today? Well, it gives us a bit of perspective when we say that the Eucharist is a “sacrificial meal of reconciliation.” No part of this phrase need stand in opposition to any other part of it. Sacrifice, meal, and reconciliation appropriately belong together. To argue otherwise seems to stand in contradiction with the milieu from which this rite is coming. Rhetorically, Paul is insisting upon the continuity between pagan sacrifice, Jewish sacrifice, and the Eucharist: the same intrinsic mechanism occurs – the act of sacrifice and the subsequent sharing in the meal is a sharing in and with the spiritual being with whom the sacrifice is performed, whether divine or demonic. Now, exactly how the Eucharist is a sacrifice, and what we mean by that, has been a major point of argument between Protestants and non-Protestants (Roman Catholic and Eastern Orthodox alike) ever since there were Protestants. I have no interest in refighting these fights nor do I think we need to in order to get at what we are aiming for. To really get at the heart of the prayer book spirituality of the Eucharist, it is sufficient to agree on this central point: we are participating in Christ’s own self-offering at his own invitation. We don’t believe that anyone is re-sacrificing Jesus. Indeed, the book of Hebrews goes to some lengths to note that one of the ways in which the self-sacrifice of Jesus is greater than that of the temple sacrifices is because they must be redone year after year; the act of Jesus was done once and accomplished for all time. Rather, our repeated actions are joined to his single great action. So—here the prayer begins by specifically talking about the passion and death of Christ on the cross at [A]. Then, at [B], it moves into language that both identifies this action as an act of sacrifice, but also goes to great lengths (clearly with Hebrews 7-10 in mind!) to establish several things: that this death was fundamentally a self-offering—not forced, that this one offering was sufficient for all times, and that this act in itself accomplished the everything that needed to happen to reconcile God and humanity. Having established these points, the prayer comes back to the Eucharist itself and identifies it as a regular reminder of that sacrifice (using the word again to make sure we don’t miss it…) for the Church. Holy and gracious Father: In your infinite love you made us for yourself; and, when we had fallen into sin and become subject to evil and death, [A] you, in your mercy, sent Jesus Christ, your only and eternal Son, to share our human nature, to live and die as one of us, [B] to reconcile us to you, the God and Father of all. Here we see the same fundamental pattern. In [A] Jesus is sent to us. The mention of his death is balanced by mention of his life—a reminder of the redemptive action of the Incarnation—but it is clearly in focus here. Then [B] identifies the goal of both his life and death: reconciliation between God and humanity. While this prayer doesn’t use the same sort of legal language to proscribe the terms of the reconciliation as the Rite One prayer above, this section functions in the same way as the [B] part of the previous prayer, assuring us that the reconciliation promised was effected by the totality of Christ’s life and death. Continuing, [C] specifically moves to the cross and picks up a few remaining points. Again, it specifically uses the word sacrifice and, in direct reference to it, emphasizes that this cruciform death was a self-offering. It was not an accident nor was it compelled: it was a decision, freely given. Sacrifice here is functioning as a central vehicle of reconciliation. In Antiquity, who you ate with carried great significance, particularly social significance. To eat with someone said something public about who you were and what sort of company you kept. Remember, one of the chief charges against Jesus was that he ate with tax collectors and sinners, the wrong kind of people. Just as in the Homeric sacrifice we saw former enemies sitting down together around a meal, the Eucharist likewise gathers together a broken humanity in an act of reconciliation. People are brought together over food. But the bidirectional aspect we noted in the Homeric sacrifice is present here as well; this is also where we recognize that the Eucharist doesn’t just focus on the Last Supper and the Passion—it also connects us with those odd meals on the foggy lakeshore and the journey to Emmaus where the disciples break bread with the Risen Christ. This memorial of his passion is also a remembrance of his resurrection and of his resurrected communion with his disciples. And that brings home one of the key points about a sacrificial meal. It wasn’t just about sharing a meal at the temple with your family and the other people you brought with you to help celebrate, and it wasn’t just about sharing with the priests; you were all sharing a meal together with the god as well. Our Eucharistic meal isn’t just a remembrance of a dead Jesus, it’s eaten in the presence of the Risen Christ. Both of these factors play an important part in what’s going on in the Eucharist. Recognizing and growing deeper into the spirituality of the Eucharist is bound up with our ability to grasp the sacramental paradox: in the Eucharist, the Body of Christ is eating with Christ and is eating Christ in order to participate within Christ’s work of the reconciliation of all creation. There’s one more point that I want to loop back to as we consider the relationship between the Homeric sacrifice and the Christian Eucharist. That’s the notion of the hecatomb. As we said before, the hecatomb was a sacrifice of 100 cattle. It represented a huge amount of wealth dedicated to the god. It was precious and costly. Where is that element in our rite? We offer bread and wine. That’s not terribly expensive—particularly given the sort of wine we normally get! You see—if we take the language of our prayers seriously, we are offering something costly at the altar. We’re not just offering Jesus—we’re offering ourselves as well. This entry was posted in Anglican, Liturgy, Sacraments and tagged Prayer Book Spirituality Project on November 15, 2013 by Derek A. Olsen. Excellent and interesting chapter. One very minor grammar note: “I’m not going to try and be” should be “try to be.” Your phrase is the colloquial, which is fine if that’s what you want. A fantastic narrative! It really gets the idea of “reconciliation” across – which is something I normally don’t think of at all – and which I’ve never seen explained better. Now, I don’t think I’ll ever see the Eucharist in quite the same way again…..
I’m so glad you’ll be reworking it! If you need help chopping out the excesses, I’d be glad to help. Another great installment. I wonder if it would be helpful to start with a description of the Jewish / Second Temple sacrificial system, or at least work a little more of that in. I have always found it helpful to think of the Eucharist (and Atonement) as a fulfillment of the Jewish system and in contrast to the pagan understand of sacrifice, but your analysis drawing the connection between Homer, the passion, and the prayer book is good stuff. This comment isn’t about this particular chapter, but a more general question. Our EfM mentor was telling us about a conference on reforming the liturgy she attended last week. 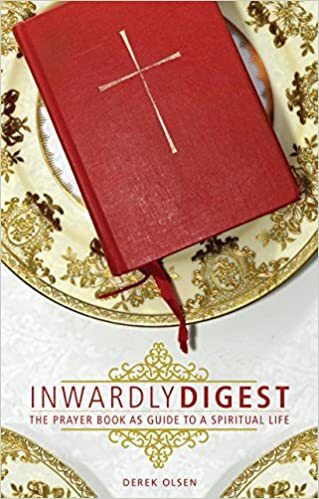 Apparently, there was much attention paid to removing from the liturgy “leftover strings to the past.” How do you see the Episcopal church coming together over whether the liturgy should be a twenty-first century creation or a link to the traditions of the church? The gap is so large between the two sides. I’m a firm believer that those strings to the past are an essential part of who we are and what we’re about. I personally don’t understand why we would want to cut them especially since so many people my age and younger are interested in the historical continuity in the liturgy and larger faith. They were even discussing eliminating the confession because it’s covered by the Lord’s prayer! I’m not quite as attached as you are to the historical continuity as you are, but cutting all ties to the past is ridiculous. If we cut all ties, we’re no longer Christians, but inventors of a new religion. I’m glad you’re on the liturgy committee to counter the throw out the baby with the bathwater extremists. I just don’t see how you reconcile the two sides. Kind of an “elephant in the living room” situation there, I’d say…. I do hear your point on including the Jewish sacrificial material. I’m wary of doing so for three reasons. First, I don’t know a massive amount about it, but what I do know is that good, solid evidence for Second Temple practice is very hard to come by. You either have to work through the legislation in the Torah—which likely has roots in 1st Temple practice—and then work to adjust to 2nd Temple practice from there or go the other way and assume that the Mishnah is fundamentally accurate even though you’re dealing with third century materials. I’m sure work has been done in both directions, but it’d be new literature to me and might require quite a bit of sorting through depending on how I’d approach it. Second, I’m always worried about scope-creep. I know this is a real temptation for me, and I’m trying to resist at every turn when the little voice in my recommends that I just read a few more books before writing… Third, when I roughed out the chapter in my mind and tried it out in an Adult Ed class, this was the shape it took. I had a good source and a clear direction that proceeded from it. To go back and add in more might muddy what’s already here. I facilitate a Bible study on Sunday’s for an Independent Catholic Christian Church. We were having this discussion last Sunday. A member of the parish pointed us to this article and it helped to clarify some points for some of the participants. Thank You.